The stunning image circulated on social media the past couple of days. 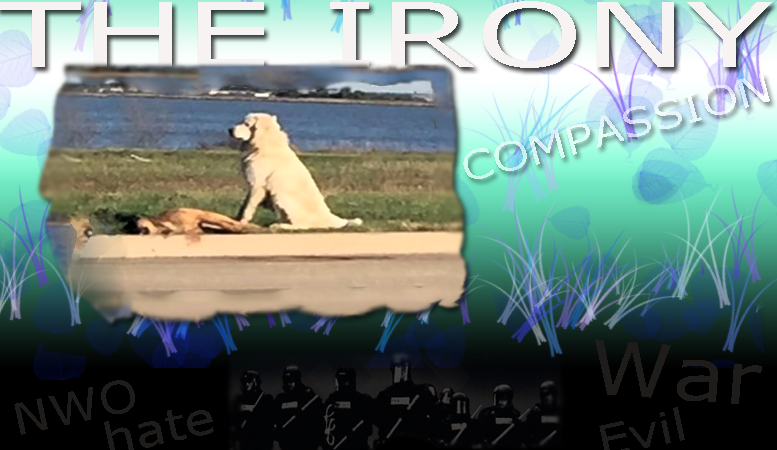 A Great Pyrenees dog motionlessly standing guard over another dog on the side of a freeway in Dallas Texas. Brian, the Great Pyrenees who apparently, along with his partner Marley, a Shepard mix, escaped from an open garage door and wandered away from home. After wandering into a road, Marley, Brian's partner apparently was struck and killed by a vehicle. According to animal rescue workers it appears Brian dragged his partner to safety off the road and stood by her as she died from her wounds. The images of this heart broken dog, loyally standing by his wounded partner on the side of the road is not just a heart warming story, but is also a reminder to us that throughout all of nature species look out for each other. The principle of Care dominates our planet and even animals understand it very well. Animals understand and identify with the concept of compassion and they understand loyalty. We've seen situations in the past where animals show more compassion than humans. But this one time I'm reminded that if we as humans can't equally care for each other the way dogs do in urgent situations, then humanity has much to worry about. I'm also reminded how this story puts into perspective the level of evil that we are all subjected to every day when dealing with endless wars, lies, tyranny and oppressive government. The rulers of this world are not able to show the compassion this dog showed for his partner. When a dog can demonstrate more compassion for nature than living human beings, including those who run this world, this is an indicator of how bad things are and how much we've been manipulated into hating and fighting against each other. Today, let us all learn from Brian, the Great Pyrenees who was photographed loyally standing by his partner after rescuing her from the road. We can learn many lessons of loyalty and compassion from Brian. And may humanity take these lessons from this dog and learn how to apply it to our lives. This is but one story. Every single day there are lessons all around us being taught to us by the animals. We can watch and see how they commune with each other and with nature instead of attempting to senselessly dominate each other. Every day we can watch them and learn how to love one another and care for one another. Is anyone paying attention? This is the question I'm asking after seeing this story. I am. And I hope others are too, because as we move forward the control system looks to divide us like never before with wars of race, gender, religion, politics and more. The control system is waging war on humanity trying desperately to divide us. So pardon me as I cherry-pick this story, which on the surface seems irrelevant, but a deeper look shows it has many lessons to offer.